Days of Wonder don’t release many games, but when they do it’s time to break out the wallet and go grab a copy, because they’re almost always something very special. 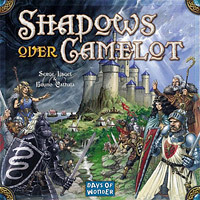 Their newie, Shadows Over Camelot is no exception. The first thing to get your head around—after you’ve drooled over the beautiful and copious contents of the box—is that this is a co-operative game. In other words, the players attempt to defeat the game, instead of each other. This initially strange concept is most known to players of Reiner Knizia’s Lord of the Rings game. I had misgivings, but it turns out the game is completely successful, plus there’s the added spice of one player possibly being a secret Traitor, whose object is to help everyone lose and thus win the game for himself. Days of Wonder have really pulled out the quality stops on this one. Not only do you get a main board and three supplementary boards, beautifully illustrated cards and ‘character sheets’, but also thirty nicely sculpted plastic figures to represent your Knights, several Relics (the Holy Grail, Lancelot’s Armour and Excalibur) and a bunch of Siege Engines, Saxons and Picts. Obsessives like me can paint these up to make the game even more attractive. The game initially seems complex but is actually quite easy to play. Basically, each player is forced during his or her turn to make a ‘Progression of Evil’ action (usually drawing and playing a Black card or placing a Siege Engine around Camelot) followed by a Heroic Action (usually embarking upon or attempting to fulfill a Quest). You place various combinations of White cards on the Quests versus the Black cards that are mounting up. If you win the Quests, you get extra cards, lives, and most notably, White Swords to be placed on the Round Table at Camelot. Losing takes away lives and adds Black Swords to the Table. If you manage to avoid Camelot being totally besieged or everyone dying, a majority of White Swords at game end wins the day. Of course various special White and Black cards spice things up. Before long you’ll find Camelot besieged, Picts scrambling out of the forest and Saxons running up the beach, Knights desperately trying to complete Quests before it’s too late, and everyone laughing, groaning and cheering with the draw of every new card or roll of a dice. As I said, players can co-operate, but can only share cards in special circumstances, and even then information can only be given away in character. So instead of saying, “can someone give me a Fight card of value 5 to help beat the Saxons” you’ll soon be intoning “My Lord, I feel I can hold the barbarians at bay for just one more day, but surely my forces will bow under their onslaught if I do not receive fresh reinforcements post-haste!”. Of course should one of the players have been secretly dealt the Traitor card, they’ll be sneakily doing their best to undermine everyone’s careful co-operation. Get a group of valiant Knights and Ladies together, a few cups of wine and mead, and together save the kingdom. Just watch out for that Traitor. Four and a half Excaliburs out of five. Of course, I’ve made up a colour Shadows of Camelot Rules Summary you can download here. I haven’t played a game like this in a while—cardboard counters and attack/defense ratios no less! This ol’-fashioned wargame was brought out by Games Workshop in 1993, and it’s been sitting unplayed on my shelf ever since. A friend and I finally gave it a run last night and it turned out to be a lot of fun. For those of you who remember the style, you ‘stack’ cardboard counters with attack, defense and movement numbers on them, and move on a board divided into areas, in a bid to outgun and outwit your opponent. Combat is worked out on a table where you cross-index the attack/defense ratio with a d6 roll. In this case, the whole thing is wrapped up in the atmosphere of a Chaos invasion of a planet and the attempt of the Chaos leader Horus to thow down the Emperor. Goodies versus baddies, in a nutshell. What makes the game interesting is the way the waves of Chaos attackers land from orbit to batter the Imperial defensive positions. The Horus player has to secure a spaceport or two early on in order to ensure the bad guys keep coming. The Imperials can shelter behind walls and try to wait it out— walls decrease your odds of successfully attacking considerably, and the game is only five turns long—but eventually those waves of attackers are going to topple the walls, so it’s not much of a strategy. The atmosphere is thick, and it’s easy to imagine huge Titan robots battering at the fortifications, and hordes of gibbering creatures pouring through the breaches. Inevitably a dice-heavy game like this has a high random element, but this was never a game for ‘realistic’ wargamers, just a fun, atmospheric return to those days before miniatures; and to me there’s nothing more enjoyable than a hard-fought game boiling down to a few crucial dice rolls! You may want to institute a few house rules though, especially since the rules are not the clearest. We decided to allow players to set up the order they would receive Special Cards, which give players special abilities, rather than draw them randomly, for example. This means that if Horus gets a lucky hit on the Emperor with a bombardment, the Imperial player could play a Heroic Sacrifice card, throw some poor lackey in to take the bullet, and your game isn’t over before it’s started. The companion game to Horus Heresy, with similar rules, was called Battle for Armageddon, and rather generously on the part of Games Workshop, it’s available as a free download. So there’s no excuse for not trying it out! Four Daemon Hordes out of five. Don’t forget to check out my Horus Heresy Rules Summary and Reference Sheet here. Anyone who has any interest in the history of computer games has heard of Doom, the game that arguably kicked off the craze for first-person shooters. Recently Doom 3 was released to great fanfare (and sales). But for those of us who prefer our sci-fi demon killing mayhem in good old-fashioned boardgame form—more sociable, more fun, less stress—Fantasy Flight Games have released Doom: The Boardgame. If you’ve ever played and enjoyed such games as Space Hulk or Advanced Space Crusade you’ll be in familiar territory with Doom. Your marines explore the corridors of a dark, bloodstained complex, fighting off all manner of huge ugly beasties with an array of satisfyingly effective weaponry. FFG have pulled out the proverbial stops with this game, and it shows. The big box is chock full of corridor and room sections, beautifully illustrated and printed on thick, hard wearing card. There are 66—count them, 66—figures with which to fight your battles, nicely modelled in plastic and some of them huge. Prepare to use hot water to flatten the bases of these figures as the plastic is somewhat bendy. If you enjoy painting your miniatures there’s plenty to keep you occupied here, but even a few simple coats of paint and some dark washes will improve the look of your games immeasureably. Finally, numerous counters, cards and reference sheets fill out the box. This is definitely one of the more satisying ‘rip off the shrink wrap and rummage happily through your new game’ moments I’ve had for a while! The gameplay lives up to the quality of the components; Doom is a pleasure to play. The games can last a bit long—our last game clocked in at about five hours—but without the ‘game fatigue’ that usually results, thanks to the easy and enjoyable mechanics. Each game is scenario-based (hopefully FFG will make more available soon), with the creature player setting out the board pieces, opponents and pick-ups as the marines discover them, along with ‘spawning’ extra creatures with the play of cards. Some reviews have concluded it’s too difficult for the marine player(s) to win, but I’ve found the game balance to be about right; and FFG have recently made available a downloadable expansion that allows players to set the difficulty level. Doom is a lavishly produced, highly enjoyable game that fans of the 80s ‘big box’ games like Space Hulk and Heroquest will especially love. And it may even bring a few trigger happy video game players into the world of boardgaming. Four and a half BFGs out of five. Don’t forget to check out my Doom Rules Summary and Reference Sheet here. What a great sound: a handful of dice being thrown across a plastic board. That’s not the only thing that brings back vivid memories of childhood when you play Heroscape, the new return to ye olde days of big games with lots of plastic components from Hasbro. Sure, open that big brightly coloured box, see all the plastic bits and you might think we’re starting to cross over that nebulous line between game and toy here, but the important thing is, is it fun? You bet it is. If you used to play miniatures games but rapidly got sick of spending valuable game time reading all those intricate rules, mucking about with tape measures, and painting figures, then this is the game for you. Heroscape comes in a big flimsy box bursting with plastic bits. You make up your board from snap-together 3D plastic hexes that come in a variety of types: grass, rock, sand and transparent blue water tiles. Choose your armies using one of the scenarios supplied or use the simple points system, and have at it! The figures are good quality and well-painted (though I shudder to think of the Chinese sweatshop where this is being made … someone out there is painting just the sword on a samurai figure then passing it to the worker on her left) and best of all, ready to fight. There are Basic and ‘Master’ rules, but go straight to the easy-to-learn Master rules. There’s nothing new here; it’s roll for initiative, move, and attack, but simplicity is what makes Heroscape such a blast to play. The combat system is spot on: the attacker rolls a bunch of red dice and the defender rolls blue; every Shield on a blue dice blocks a Skull on a red dice; those that get through cause a Wound. This makes for a lot of enjoyable head-to-head dice rolling. Special abilities for different figures mix things up a bit. Our first game was a fast and furious battle that came down to a close fight between our last two figures; and if you don’t enjoy a slug-a-thon between a WWII paratrooper commander and a robot that looks like it wandered off an episode of Dr Who, you’re not going to enjoy this game. Yep, the background rationale is flimsy—warriors gathering in Valhalla to slug it out over some mystical Wellsprings—but that’s not what this game is about. Hasbro are onto a winner with Heroscape’s flexibility and expansion potential, and the inevitable extra figures are already hitting the shelves. You’ll find my Heroscape rules summary sheet in the Freebies section. The perfect ‘beer-and-pretzels’ wargame. Four and a half plastic hexes out of five. Remember those classic road combat scenes in Mad Max? Ever felt the urge to flip the little red plastic switch mounted on the dash and send a rocket at that idiot that just cut you off in traffic? Tried go-cart racing and got in touch with your inner hoon? Fallen prey to road rage? You’ll love this game. Battlecars is a forgotten classic from the golden age—the 80s—of Games Workshop games, before the company became a billion-dollar giant churning out miniatures for kids with parents with extremely deep pockets. Battlecars is simple, fun, and incredibly cinematic. What do I mean by cinematic? Well, it’s when a game is not only fun to play, but during the course of the game a little story develops, and you find yourself effortlessly filling in the game mechanics with imaginative, and usually hilarious, descriptions of what’s going on. For example, I recently played a game where one player abandoned his car, which was then rammed by the other player. The pedestrian shot at the attacking car with his machine gun, missed, was missed in turn by the car’s weapons, and then made a move and was shot and killed by the car on it’s next turn. End of game. But as we played you could easily imagine the driver scrabbling for the door handle as the other car sped towards him, just making a frantic dive onto the road as his car was rammed, then shooting as the driver desperately rolled up his armoured window just in time, and the look on his face as the car’s machine-gun turret slowly turned in his direction … as he makes a frantic run for the trees, the car slams into reverse and swings around to pepper him with bullets … you get the idea. A little Mad Max scene, only a lot funnier. A Battlecars game usually ends up with cars spinning, smashing or blowing to smithereens, and drivers making a run for the nearest building to escape the mess. The game comes with two generic boards crossed with movement lines, counters for grass, trees and buildings and some car templates that slowly get covered by (somewhat fiddly) red counters as they get more damaged, and on which the player places counters for various weaponry—rockets, shells, flame, MG rounds and perhaps a clutch of passive weapons such as smoke, spikes and oil. A supplement, Battlebikes, adds rules for armoured bikes. Score a copy of this gem on eBay, you won’t be sorry. And this way, no one gets hurt. 4 and a half rocket launchers out of 5. Update: I’ve made rules summary and reference sheets, plus new playsheets that combine the car/bike sheets with their appropriate driver sheet plus modifications specific to that car/bike. Available here. I’ve become obsessed by zombies! This great little game is for all you zombie movie fans out there… not only is a lot of fun, but it’s a free download. There’s also a little community of zombie game fans adding new rules to it all the time here. I downloaded the game, mounted the boards and cards on foamcard and card, and found some some old painted zombie and human miniatures which made a huge difference to the game atmosphere (told you I’m a game geek). 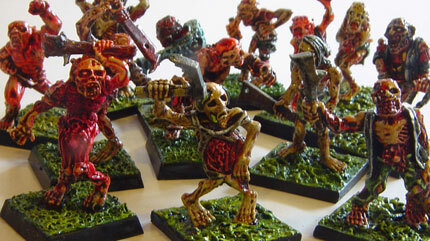 If you happen not to have some painted zombie miniatures lying around (what’s wrong with you?) you can buy some via the game download page. The rules are simple to learn—the map is of a house and garage; the humans have to search all the search squares available for weapons, and the occasional nasty surprise, and the zombies have to kill all the humans. A simple action point system keeps the zombies slow, but since they keep coming until there’s four times the number of zombies as humans… the game captures the feeling of a slow but relentless zombie assault really well. I played the zombies and my friend played three humans, two guys and a girl. Things got off to a big start when one of the guys ran straight for the car boot, discovered a ‘power drink’ and headed for the garage, only to be crash tackled by my first reinforcement zombie that appeared next to him on that side of the board and zombified him. Suitably chastened, the other guy and the girl, who had gone for the front door of the house, headed straight for the search squares. The zombies started piling in. Eventually armed with the pistol and the rifle the two humans started dishing it out, but by this time the house was filling up with zombies. The girl was getting hemmed in the bedroom when she searched the cupboard and got a Surprise! card—an extra zombie—to add to her woes. A few house rules on the spot always help when there’s a bit of confusion, so in our game we decided humans couldn’t make it out windows, used the extra Outta My Way! rules for dodging zombies, and decided that after an Oops! roll (a 1 on a dice) with a firearm, which usually means no more ammo and throwing the gun away, a human could keep it until finding an Ammo card and reload. In the meantime the other human was being chased around the living room, occasionally stopping to use his ammo-less rifle as a baseball bat… he soon discovered a new tactic however, which was to back out of a door and then barricade the door from the outside… a pack of zombies lined up on the other side then proceeded to smash through the barricade to get at him. See how much fun board-gaming can be? Four double-barrelled shotguns out of five. More: You can download my own re-work of the cards (with colour backs) here. At the risk of cementing my geek credentials even further, I have to admit that one thing I enjoy in this life is a good boardgame. For the past decade or so I’d treated this as ‘the love that dare not speak its name’, until my new girlfriend encouraged me to vive la difference! and bring my boardgames out onto the bookshelf in plain view. Now I’ve rediscovered the joy of gathering friends around a table of an evening, downing a few bottles of good wine and laughing your head off around a well-designed game. So I’m adding boardgame reviews to Headless Hollow. In recent years there’s been a rash of excellent, high-quality boardgames published, especially from Germany. My first review is of Citadels (2-7 players, 20-60min playing time), orginally German but now available in English from Fantasy Flight Games. In Citadels the object is to build a medieval city of eight districts before the other players. The twist is, each round the game changes as players secretly choose who they are for the round—king, architect, merchant, thief, bishop, assassin, etc—and these new roles bestow different powers and income. All the classic ingredients of bluff, last minute reveal, treachery and diplomacy are there in an easy-to-learn and quite short game. The card artwork is beautifully done and has a lot of personality, and the little solid plastic gold pieces are a great touch. Though better with four players than two, the game is a winner and highly recommended for an evening’s entertainment. 4 and a half gold pieces out of 5.